KayKiSpeaks.com: Usher's Impromptu Jackson 5 Karaoke..Does He Not Know these Words? 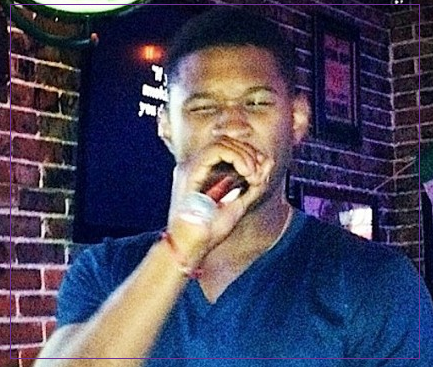 Usher's Impromptu Jackson 5 Karaoke..Does He Not Know these Words? Usher surprised fans in a karaoke spot in LA this week by actually grabbing the mic to sing the hit, I'll Be There, made originally by the Jackson 5. Though Usher baby usually has a very sweet falsetto tone- he's not really hitting all of these notes very well. He also seems to not know all of the lyrics..
Who cares though!? It's karaoke! It's just for fun anyway!!! He probably had had a few drinks by then.. it's been a pretty tough time for the r&b singer who is in the middle of a custody battle with ex wife Tameka Raymond over their 2 sons. As if that isnt enough pressure, his stepson, Tameka's 11yr old Kile died a month ago from injuries he sustained in a jet skiing accident. Usher then caught a lot of slap for continuing the custody battle with Tameka. For a moment at least this week- Usher got to have a little fun and sing some MJ..Check it out below.